The Internet has had a profound impact on entertainment, particularly since individuals have been able to gain access to it on the computers within their own homes, and more recently on portable devices such as mobile phones and iPods. It has provided entertainment creators with another avenue to explore, not just in still image and text but interactively with sound, motion and the live updating of content. According to Fanton (2008) "We are witnessing the first generation to grow up digital — coming of age when the use of computers, the Internet, video games and cell phones is widespread". With this first digital generation of individuals we will no doubt see new entertainment forms and hubs arise, much in the way that we ourselves have seen entertainment change before and after the mainstream introduction of the Internet to homes. Through the Internet, individuals worldwide are able to compete against one another or work co-operatively together as teams in a wide variety of games, the number of which is ever increasing. The content and availability of these games also differs; some may be free to play, while others require the purchase of a retail game to play. Just like books and movies, there are also different genres of games that are played, including card games, puzzle games, role playing games (RPGs) and first person shooters (FPS). Prior to the wide spread usage of the Internet in the homes of developed nations world-wide, film studios could only promote their upcoming releases with posters, magazine and newspaper articles and advertisements, and with trailers shown on television between advertisements or before a new release movie in the cinema. Current promotional websites for upcoming or new release movies still have the same content as described by Johnston at the core, but are much more feature rich. 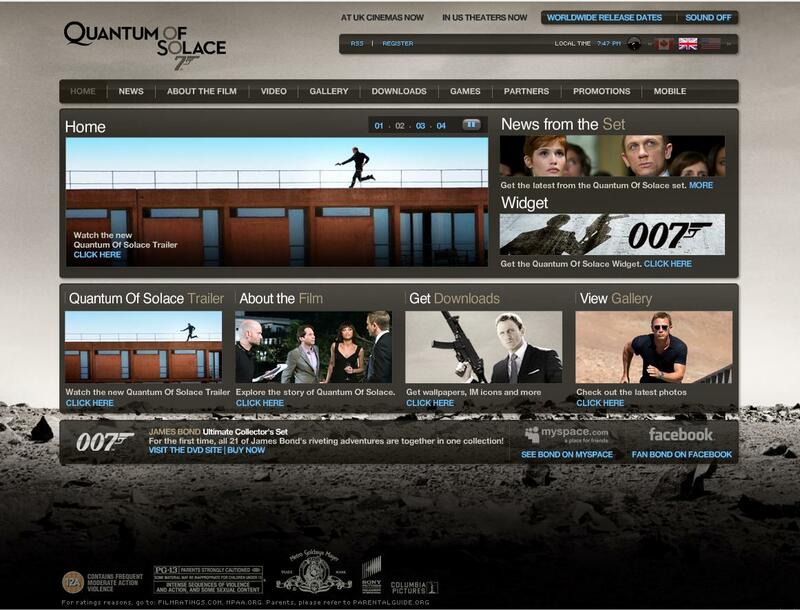 Using the Quantum of Solace website as an example, the home page of the website gives visitors immediate access to a variety of information, whether as text based news updates, computer wallpapers or gallery photos as images, as well as a variety of video features including teaser trailers and behind the scenes features with cast and crew. The above mentioned Quantum of Solace website, as well as numerous others make heavy usage of Flash to deliver their web content to visitors. These sites will often compliment the official imagery of the movie. One of the most talked about issues regarding the Internet is the availability of music online. Individuals no longer have to travel to their local music store or department store to purchase the latest CD that happens to have caught their interest. The Internet, with the help of MP3 technology, has allowed users to both distribute and gather music digitally from the comfort of their own home. The main issue for argument is the ability for users of the Internet to obtain music for free largely through the use of Peer to Peer (P2P) networks, although other methods of distribution also exist for individuals looking to obtain music illegally. Internet users can legally obtain music files by purchasing songs from online music stores. The most well known of these online music stores would be Apple’s iTunes Store, but others exist such as Amazon MP3, Napster and Rhapsody. Music files downloaded through legal online music stores will often contain some form of DRM (Digital Rights Management) technology, and will have limited options with regards to file formats for download. 2. Johnston, K.M. (2008). 'The Coolest Way to Watch Movie Trailers in the World': Trailers in the Digital Age. Convergence: The International Journal of Research into New Media Technologies. 14(2), 145-160.